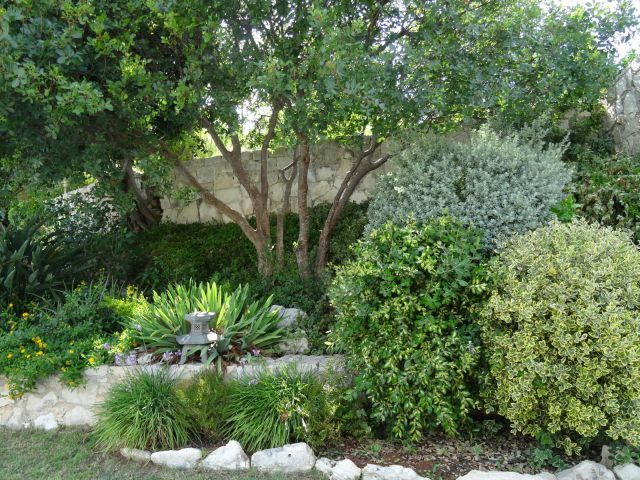 The Crete Branch is for those who enjoy mediterranean gardens. 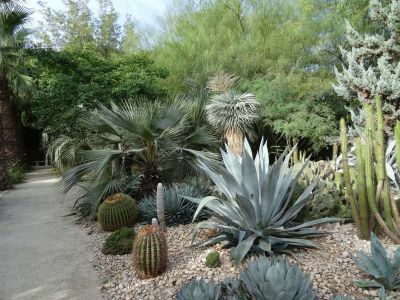 Members originate from several different countries and for most of us gardening in the Mediterranean is a new challenge. This mix adds interest to the group as backgrounds and gardening experiences are shared in our adopted new or second homes. 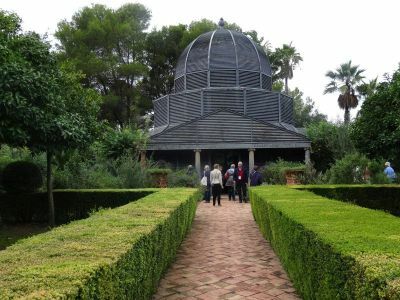 Gardening here has been traditionally vegetable and olive cultivation; there are few public gardens. Promoting the aims of the society, we exchange ideas and share experiences of particular plants, water management, propagation methods, and controlling pests and diseases. Valuing the landscape and its flora, our programme of events includes wildflower walks and talks. Our Branch Head is Valerie Whittington (biography). Current and prospective members are welcome to contact her by email and to follow the Branch on their Facebook page. The group met on a bright morning at Frances and Andy Milligan’s house in Litsarda, to listen to Val talk about her visit with the MGS to various gardens in the Alicante and Valencia areas of Spain. Val was so enthusiastic about the trip and the gardens they visited and gave us a very entertaining and informative talk with beautiful photographs of the truly splendid gardens. 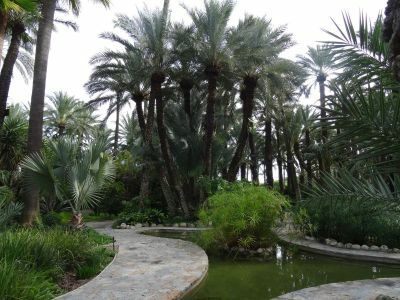 In the Alicante visit I was very interested in the Albarda Garden with its shade house and splendid palms and ferns: so green and beautiful and completely different from how we garden here in Crete. We might all have Mediterranean gardens but we all face different challenges. Val talked us through all the gardens she visited and supported her talk with photographs, not just of the flowers but of the gardens from all different angles giving us a truly lovely view into these special places. Elche and the amazing garden there was clearly a favourite; we were shown several photographs of the impressive palms and cacti from the Huerta del Cura and Palmeral Museum. 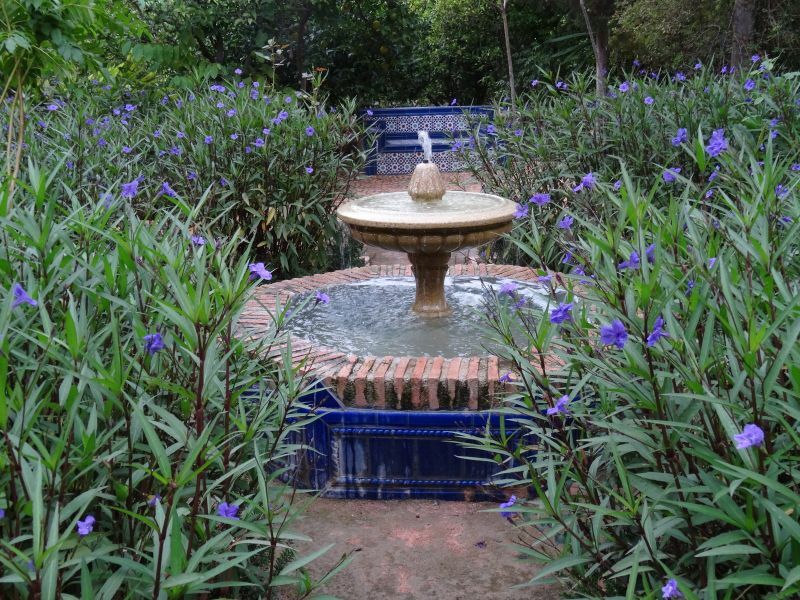 Val described Carmen del Campillo, which is modelled on a Moorish Tea garden, a ‘perfect treasure’. Her photographs showed this as a maze of colourful courtyards and interlocking rooms. The garden tour then moved on to Valencia region with many great gardens to visit. I liked the idea of the Turia Garden, designed in the old river bed to give green space to the city. 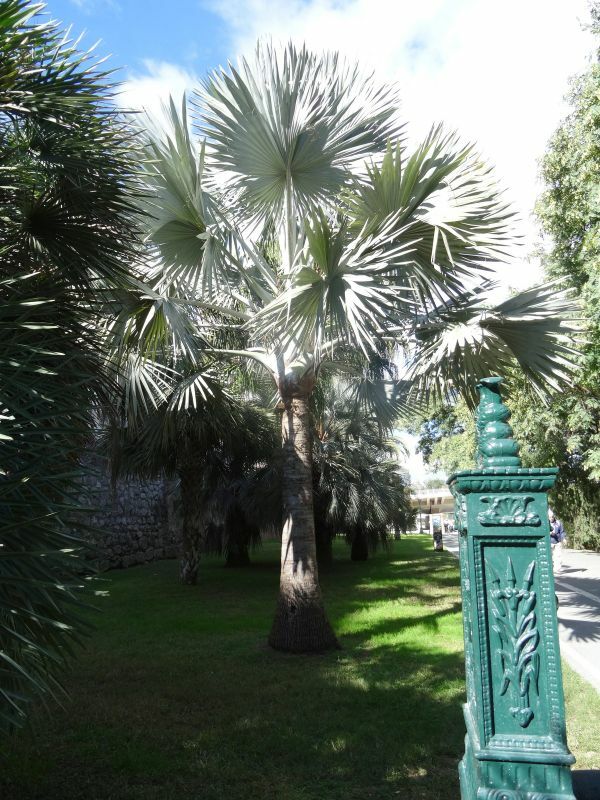 Diverse trees and shrubs were shown as were several varieties of palm along the Palm Walk. 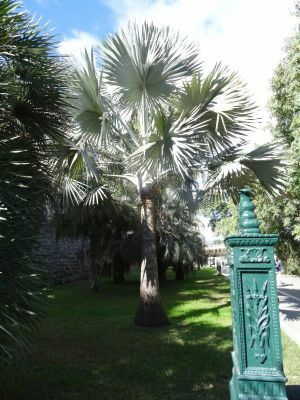 I thought Bismarckia nobilis was remarkable from the photographs shown in several gardens; a palm that several of us really wish for here on Crete. It was clear that Val was very impressed with the gardens she visited in this region and really sold it to the members present with her very informative talk and beautiful photographic journey, as many of us were making silent plans to visit this region in the future. At the end of the talk we had the opportunity to walk around Frances and Andy's large garden, which they describe as work in progress. 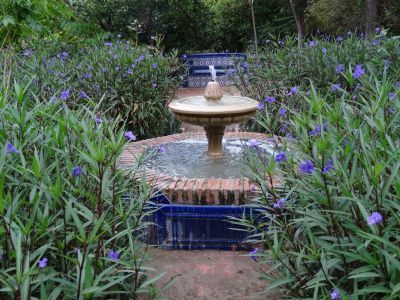 They have built several flower beds and planted lots of trees and its clear that is it going to be lovely, the most beautiful thing about their garden in March though is the fabulous wild flowers in the uncultivated areas, including many orchids: nature at its finest. They are so lucky to have all this on their doorstep. 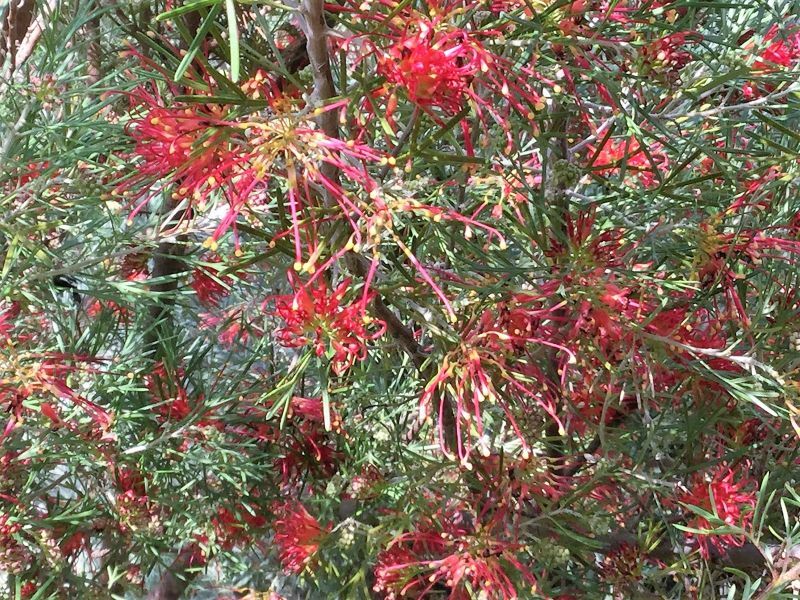 Read more about it and see images from the visit to their garden in May 2018 on the archived version of this web page. A full write up and description of the MGS AGM is available in TMG Journal No. 95, January 2019. 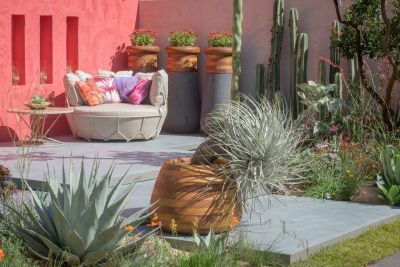 An illustrated talk by Manoj Malde: The story of ‘Beneath a Mexican Sky’, his Silver Gilt design winning garden in the Fresh Garden’s Category, at the Chelsea Flower Show in London, May 2017. This was a repeat of the presentation given in September 2017 as several members had been unable to attend. Rosemary Thomas describes this occasion: We all gathered on a lovely sunny morning in Sara and Roger Gilding beautiful garden for coffee in the sunshine before heading inside to listen to the presentation by Manoj Malde who designed a garden at Chelsea flower show in 2017, winning him a Silver Gilt medal. Manoj talked about the considerable amount of preparation required by the RHS to show a garden at Chelsea and how he came up with his award-winning design. 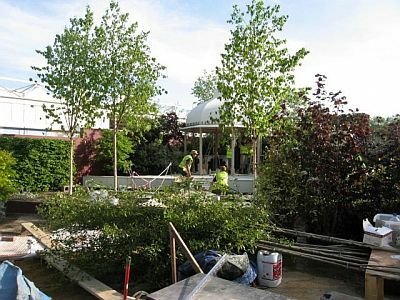 There was so much work in the planning: it is not enough to be creative in garden design you have to submit all the engineering plans and the plant provenance. 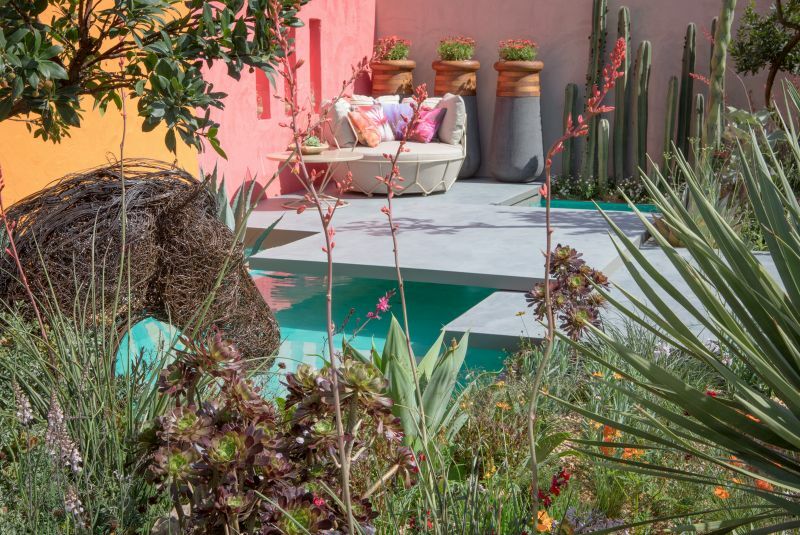 This was all worth it when we saw the finished garden design 'Beneath a Mexican Sky,' it was so beautiful with great colour combinations and sublime plantings of mediterranean plants with a very clever pool water feature. Obviously, the judges agreed and a Manoj was a very worthy medal winner. 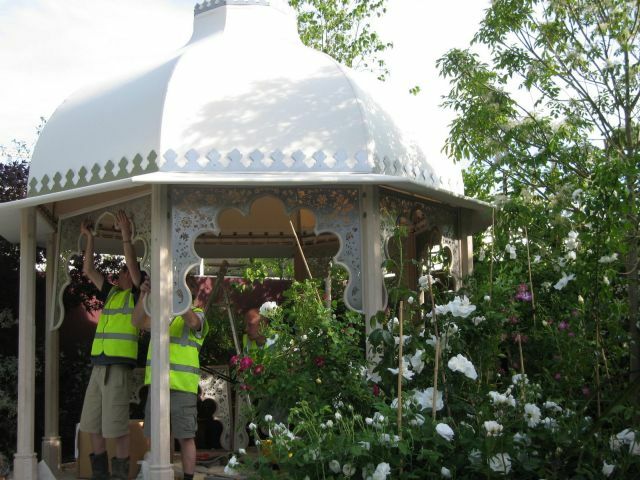 We all felt very privileged with this opportunity to see and hear the 'behind the scenes' workings of Chelsea Flower Show and everyone came away better informed about professional garden design, plant care and how to be brave with colour. It was a very enjoyable morning indeed. Photographs were provided by Manoj Malde which acknowledge his design; the build by Living Landscapes and sponsorship by Inland Homes PLC Photography copyright Jonathan Buckley. A full write up of the talk can be read in the Crete Branch web page archive with photographs showing aspects of the garden coming to fruition and a list of the plants used. 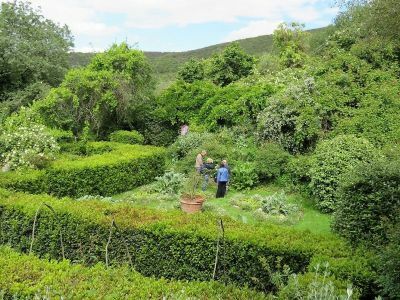 An illustrated talk by Nancy Moon: Highlights from The MGS tour of Italian Gardens in Umbria, Italy, May 2018 held at Nancy and Dave’s garden in Almyrida. Nancy had recommended reading John Joynes’ article in TMG journal No. 94, October 2018, ‘Excursion to Lazio and Umbria’, which provided very good background detail for her talk. She showed a map of the two centres where they had spent time, Frascati first and then Todi, about 80 miles further north. Speaking with great enthusiasm for the tour, she took us chronologically through the gardens visited giving us a glimpse of these lovely places through her favourite images, which were of excellent quality. I have, in turn, chosen a few photographs that the group particularly enjoyed and which provided some discussion. 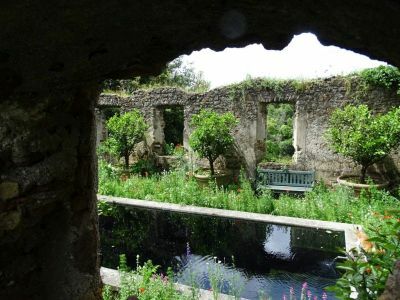 The first visit was to an estate in which the owners had created a garden within the ruins of a medieval village. 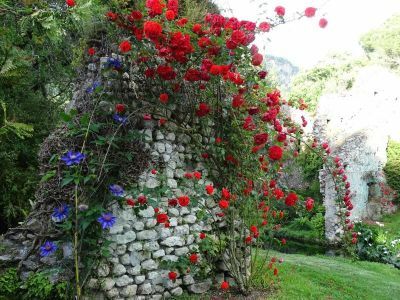 The garden of Torrecchia Vecchia looked delightful within the village walls, providing a real atmosphere. This garden looked very natural and could almost be taken for an old English cottage garden with its lush vegetation and profusion of foxgloves. A rose, Jude the Obscure, was much admired and led to an interesting discussion about the move away from the traditional rose beds in many gardens. This is a change in practise, by including roses as an integral part of herbaceous borders in less traditional planting schemes. I found this to be the case in several of the gardens we visited in South Africa, which made me look at roses in a different way, never having been keen on discrete rose beds. Nancy is keen to buy a Jude the Obscure specimen for her garden and much discussion took place regarding ease of sourcing. 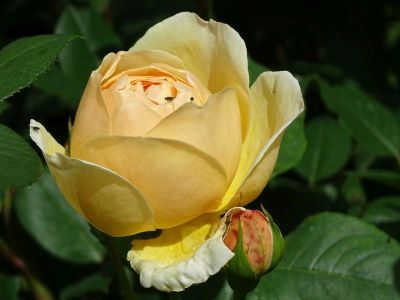 Roses do well in Crete and are very popular plants in Cretan gardens, often flowering for months on end. 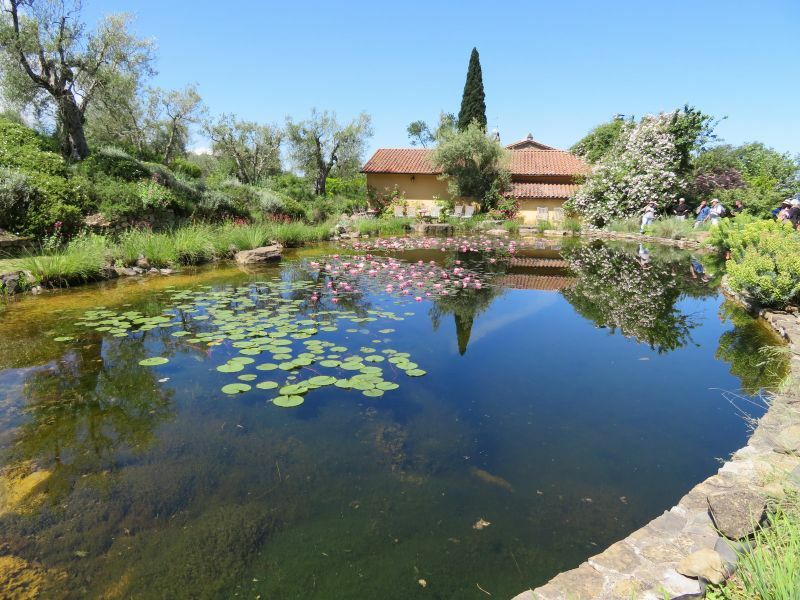 The Ninfa Water Gardens in Sermoneta has been described by many as ‘the most beautiful garden in the world’. 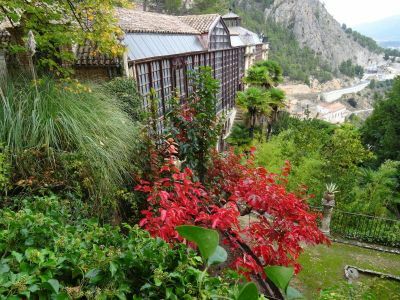 It certainly looked lovely, with dense planting providing a lush environment rich in colour and sprawling over the ruins of this medieval town. 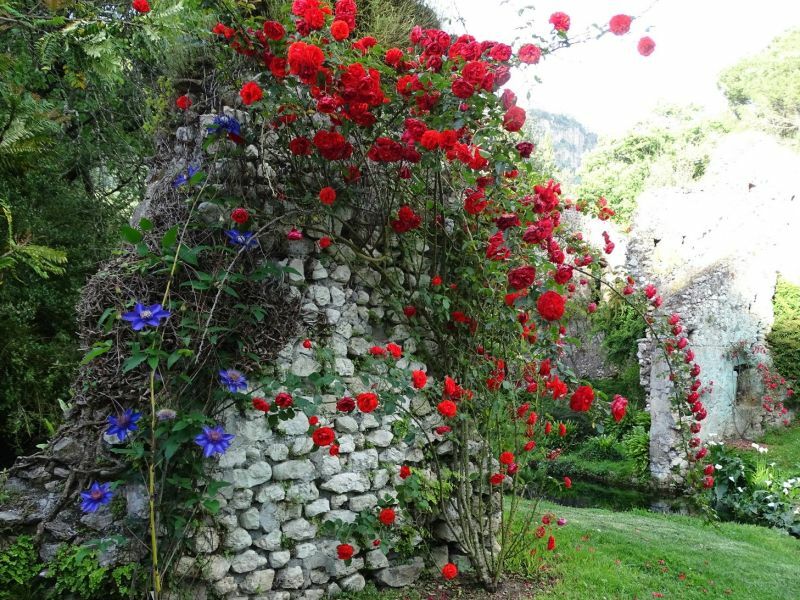 I liked the photograph below with the vibrant blue clematis climbing an old wall juxta composed alongside a deep red rose. 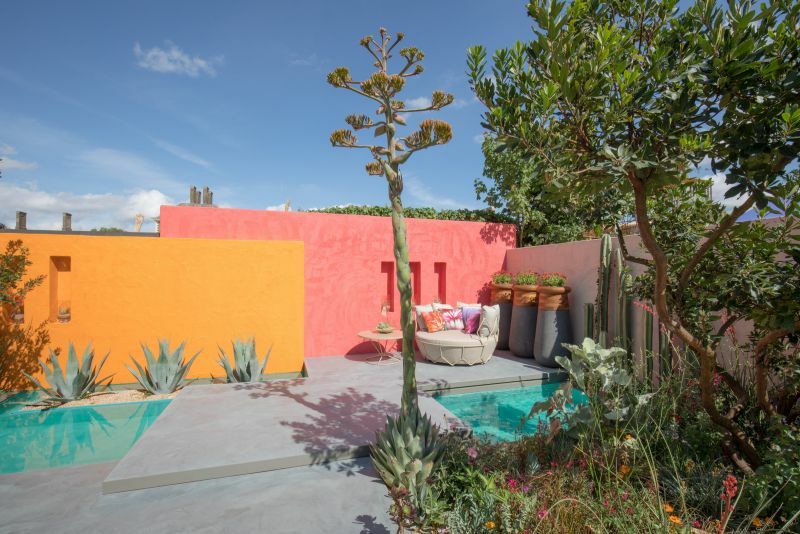 La Landriana was described as a garden of different rooms largely defined by colour. I liked several images from this garden. Purple alliums stood stately, tall. Huge sweeps of lotus plants spread in the substantial pond. There were many cheerful roses and a spectacular tulip tree. 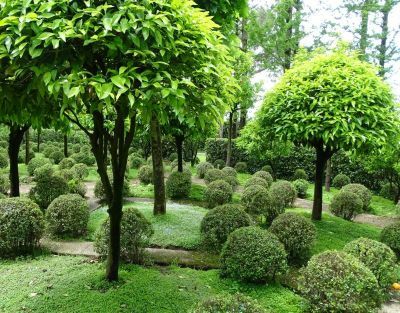 In contrast to many of the other gardens, I have chosen a formal view of ‘the room’ of orange trees with clipped box balls; it looks delightful. 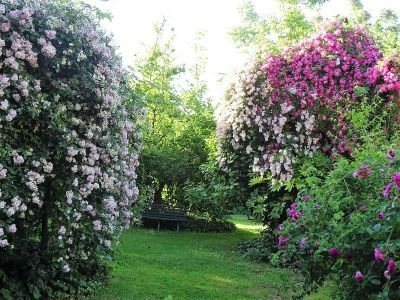 There were climbing roses in profusion in the Garden of Maresa Del Buffalo: its speciality. The images showed it looking spectacular. I understand why Nancy considers this a particular highlight. 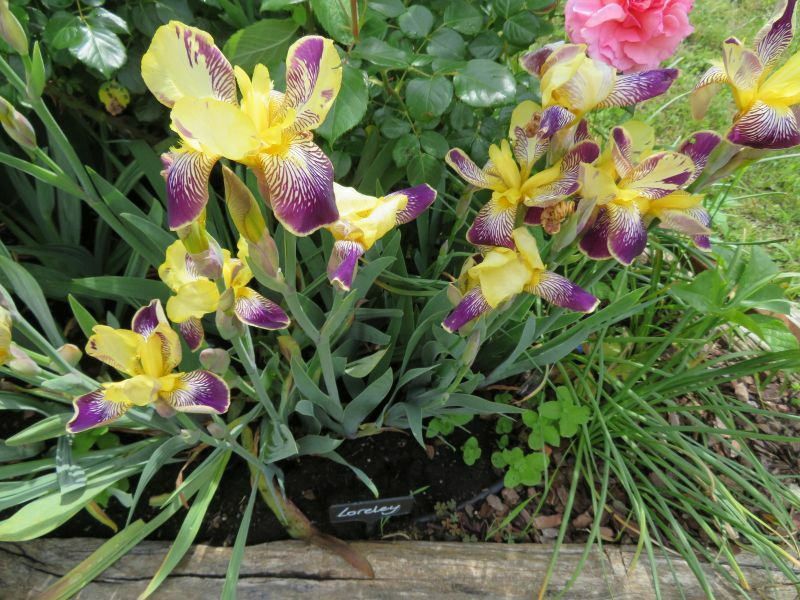 Leaving the Frascati region, the group moved north to Todi, stopping on the way at a specialist peony nursery and then the Iris Umbria Nursery where many images of pretty iris varieties were shown; ‘Loreley’ was Nancy’s favourite. The next photograph that I have selected is the focal point, a ‘natural’ swimming pond in Yvonne Barton’s garden, which I think looks most inviting. Others were less sure about swimming alongside frogs and other water creatures but liked the pond itself. One of our members on Crete has also made a ‘natural’ swimming pond which is both beautiful to look at and environmentally sound. Should more of us be developing pools in this way? Perhaps more information about doing so would be helpful. Nancy told us that Yvonne’s garden was very much in keeping with MGS philosophy. Irrigation being provided to plants for the first year or two to allow them to establish after which ‘they are on their own’. Yvonne is an MGS member in the Italian Branch with responsibility for the main MGS website, as well as that of the Italian language website. A very different garden was that belonging to Daniela Fe d’Ostiani. Having said that many of Nancy’s slides showed gardens much lusher than those we know on Crete, this one struck me as being particularly green. In the photograph visitors are almost dwarfed when exploring. The next garden, overlooking Lake Bolensa, was completely unlike any of the others we had been shown. The owner, Antonella Fiaschi, has created a large-scale rock garden which included many unusual plants including both yellow and prostrate Oenothera. Several people liked the Erigeron hugging the steps on either side of the path in the slides seen. Nancy concluded her excellent presentation by commending this MGS Tour and its organisation. She said that it was also very much a gourmet trip. 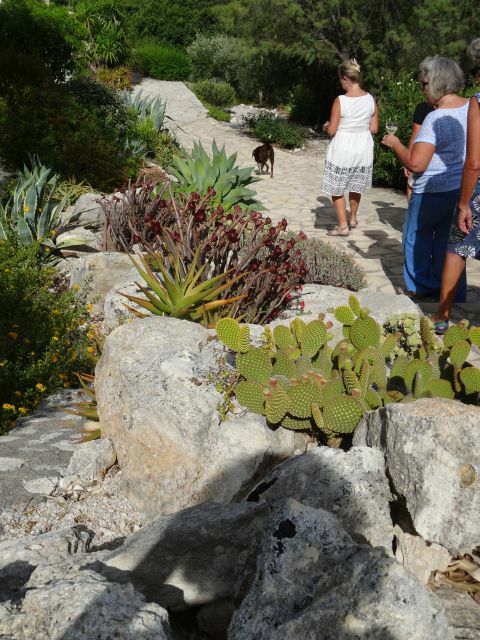 Having been on several tours myself, I had to concur that good food and company are a strong feature of so many of the Mediterranean Garden Society trips and events alongside the main emphasis of garden visits or wildflower walks. Following the talk Nancy and Dave showed us around their interesting garden, completing a convivial, informative and productive morning. Being January both Nancy and Dave felt that the garden was not being seen at its best. They will invite the group back at a later date with the full emphasis being on the garden and its development with both ‘before’ and ‘after’ photographs. We look forward to that; meanwhile a very special thank you to Nancy and Dave for the carefully selected, high quality presentation and their hospitality. 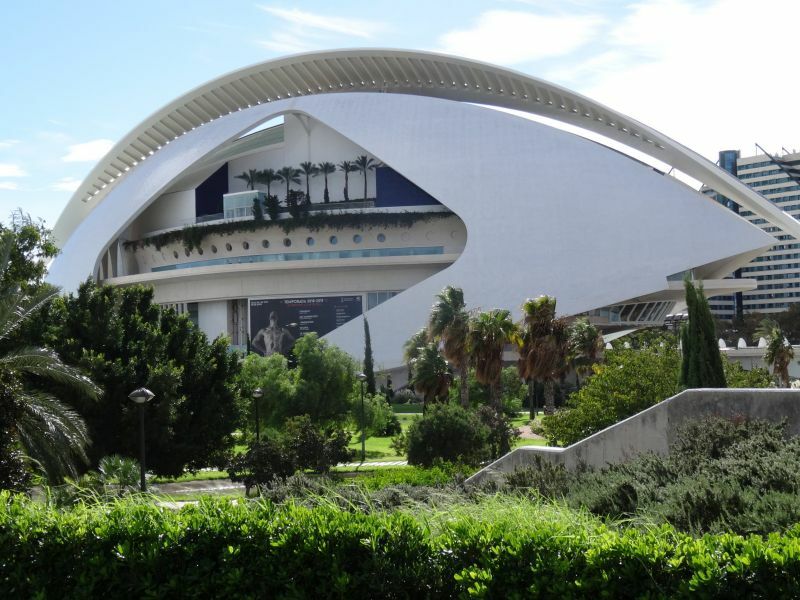 Recently returned from the MGS AGM in Spain, Valerie took the opportunity to share new developments within the society and other topics discussed at the very positive General Assembly held in Alicante. We reviewed our annual programme for 2018: much had been achieved across the year. All events have written reports on our ‘old’ Branch web page and can still be accessed on the MGS website. Everyone contributed ideas for our branch development and the programme of events for 2019: a good balance of garden visits, presentations and a wildflower walk. This was also a chance to get together to chat ‘gardens’ over morning coffee. Some stayed to look around the garden, completing a convivial, informative and productive morning. Everywhere was looking lush and green after so much rain this autumn. One member commented how different it looked in comparison to his previous visit in the summer when everywhere was very dry. 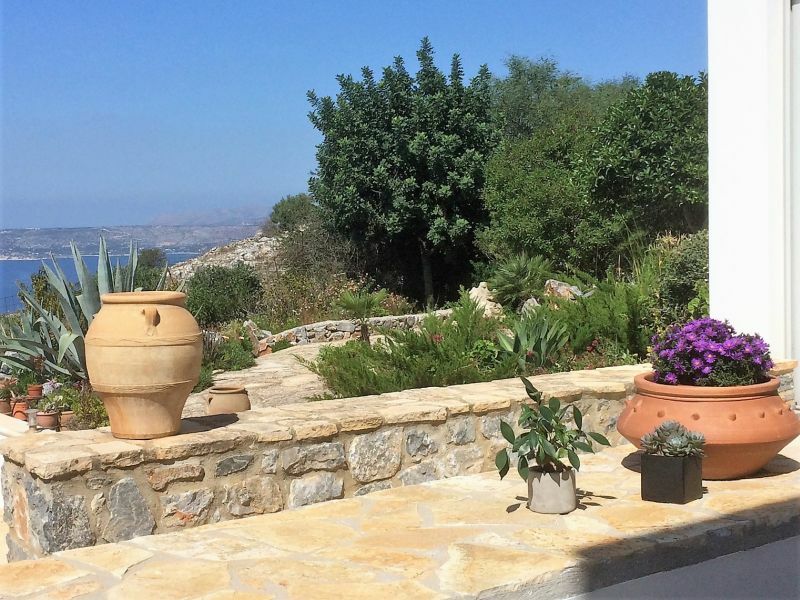 Valerie wrote about the development of her garden ‘Designing and Working with Natural Landscape in Crete’ in MGS TMG Journal No. 63. It has matured well and is fulfilling her aims: time for an article on the further development and maintaining the garden, and to celebrate her success. This garden visit concentrated on the lower bank to look at particular aspects. 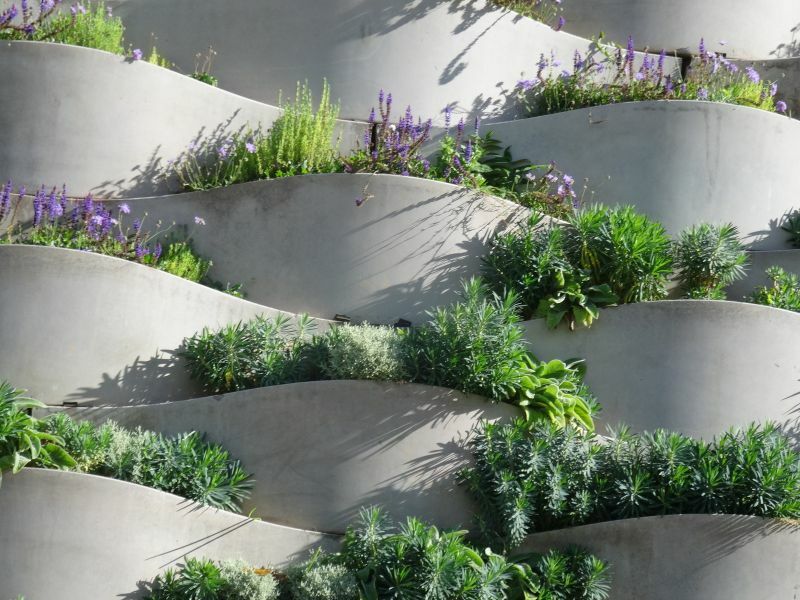 For example, as can be seen in the above photograph, simple terracing and stones around individual plants are effective in combating erosion on the bank caused by torrential rain. All the plants in these ‘planting pockets’ have been propagated by Valerie from cuttings. 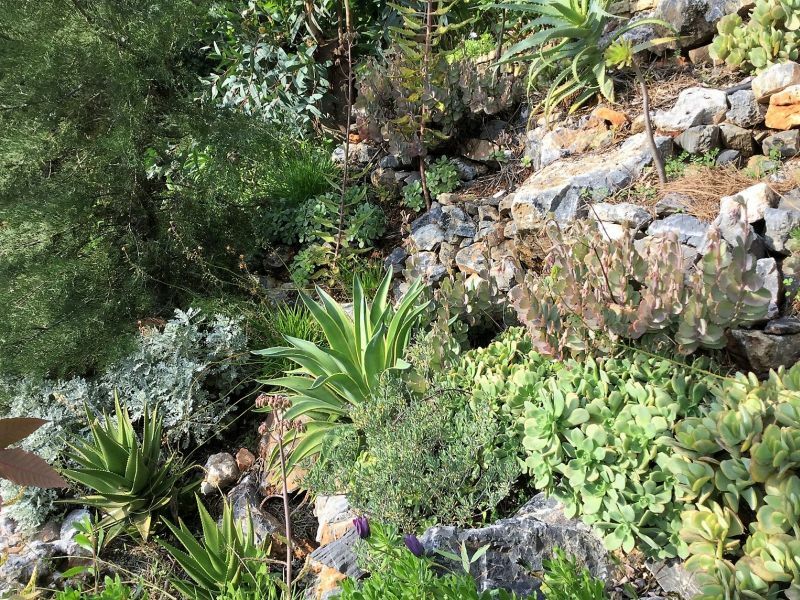 Teucrium fruticans and T. fruticans ‘Azureum’, are beautiful in bloom on the successful ‘mediterranean hillside’ section of the garden. 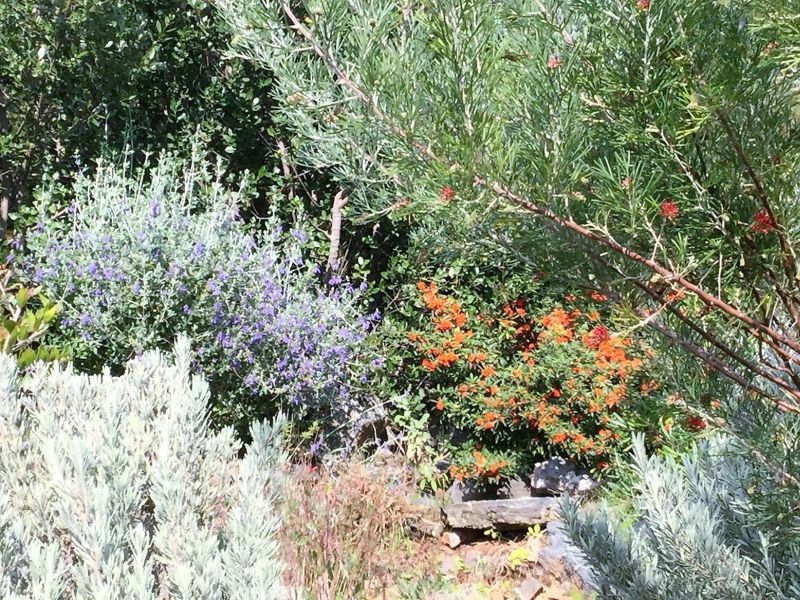 Pyracantha and Lavandula angustafolia blend in well with this section. Providing a delightful contrast is an unusual dark evergreen Senecio, successfully grown from a cutting given by Heidi Gildemeister when Valerie visited her Mallorca garden in 2011.This is propagated frequently and now features in several parts of the terraced garden. 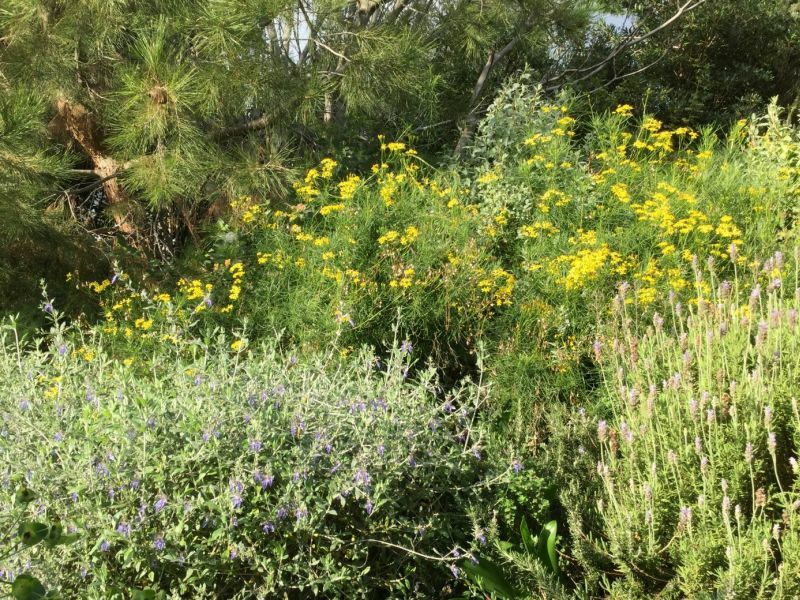 Since writing in the TMG Journal, some of the wild area below the bank has been developed to create a delightful flower bed with Rosemary repens, Grevilleas, Gaura lindeheimeri, Convolvulus cneorum, Tulbaghia and Lavandula angustifolia. The ‘gulley’ at the very bottom of the garden was completely overgrown until five years ago. Now it has been cleared, providing a completely different garden in an old river bed. Valerie is allowing wind-blown seeds to establish here as well as putting in a few cuttings from elsewhere in the garden. Petromarula pinnata and Scutellaria sieberi, both Cretan endemics, now grow here. The latterwas looking very lush after all the recent rain, even though growing in a very stony section. 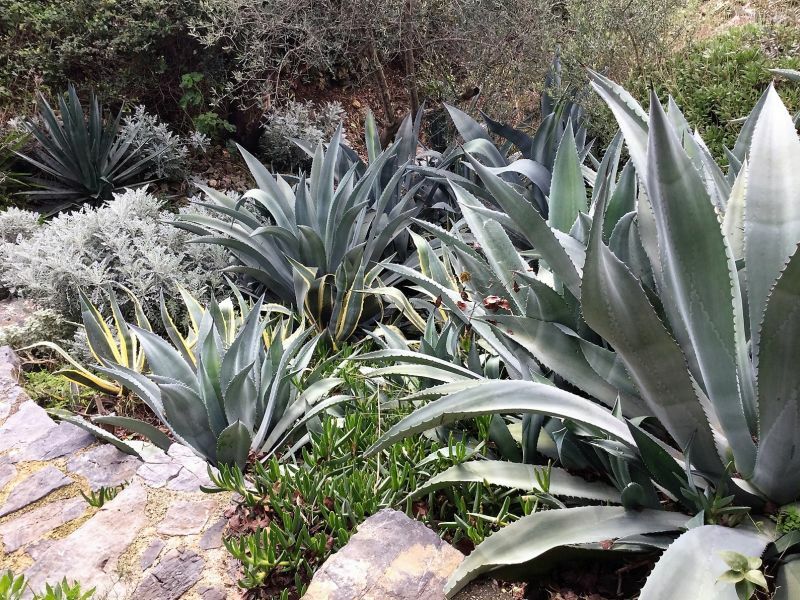 Alongside this an Agave ‘waterfall’ has been very successfully created in an area of steep scree. Several events have been held at Pam and Geoff Dunn’s home over the years where they have space for us both to meet informally and to enjoy more formal presentations. 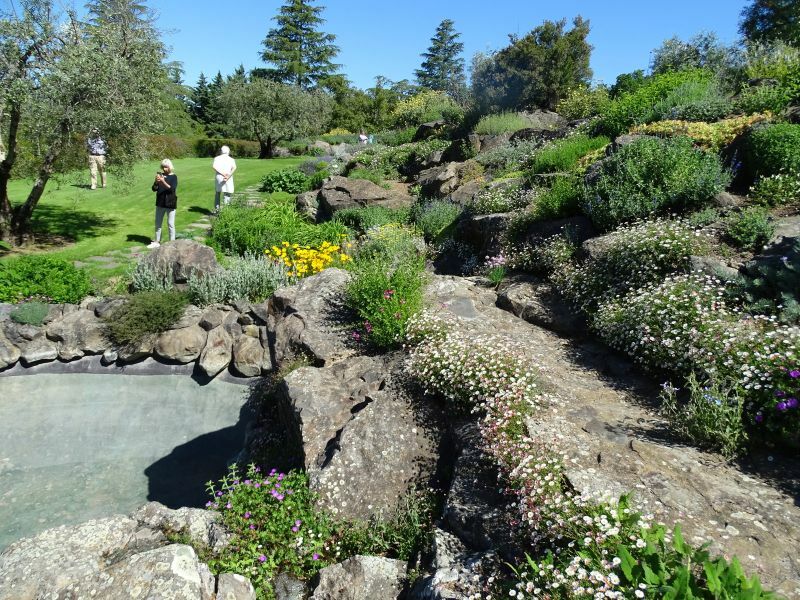 Members always have the opportunity to look around the garden at these events. On this occasion, before Yvonne’s talk, Pam showed us around their immaculate garden. 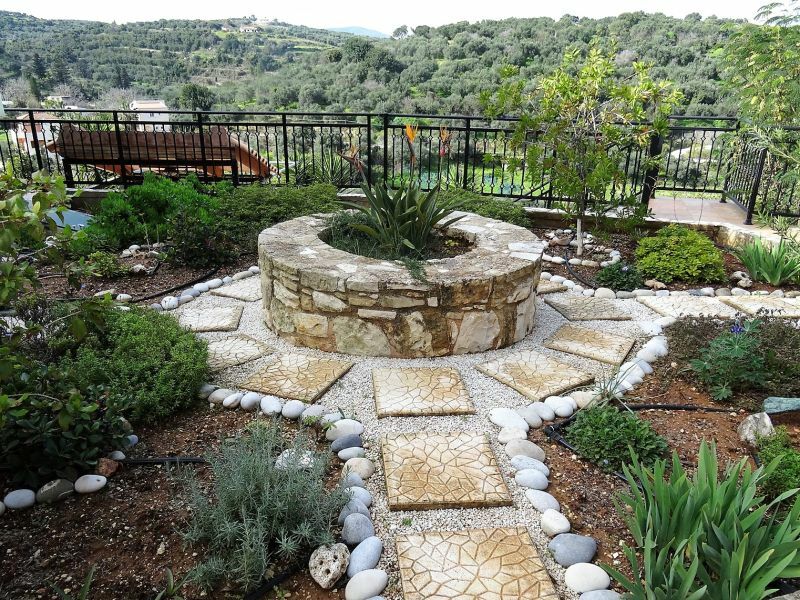 For more detail about this lovely garden look at the article written in June 2013. Since that time plants have matured considerably. The photograph above shows well-established succulents and agaves filling the spaces and providing a contrast between the rocks on the side of the path linking the two houses. Further into the garden there were interesting plants such as Cascabela thevetiaor yellow oleander, Caesalpinia gilliesii (syn.Erythrostemon gilliesii) a beautiful shrub commonly known as bird of paradise tree (it is not related to Strelitzia reginae; which is also called the bird of paradise). 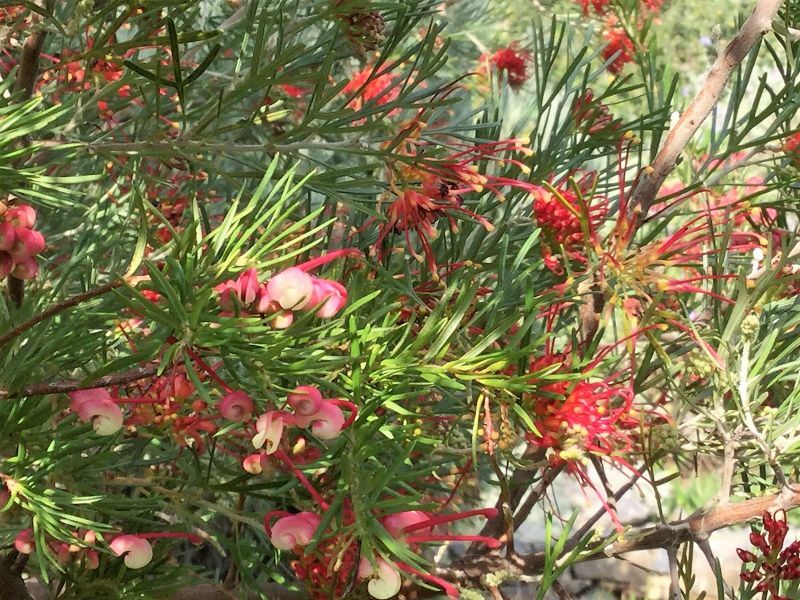 Leucophyllum frutescens, or barometer bush, has small vibrant purple flowers when watered or after rain; this is a compact but loosely branched shrub that Pam shapes in her garden. Following the garden tour Yvonne Innes gave a fascinating talk about her commission for the 2008 Chelsea Flower Show. Yvonne is a garden designer and plant consultant who has extensive experience, including work in Spain and France. 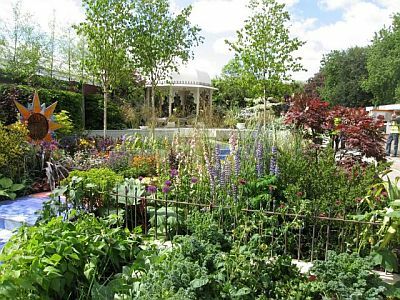 After George Harrison’s death she designed a Chelsea Flower Show garden in his memory, commissioned by Olivia Harrison, his wife. The main focus for this evening’s presentation was the background, design and implementation of this particular garden called ‘From Life to Life, a Garden for George’. 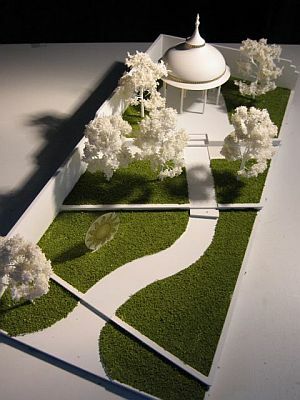 The design for this memorial garden for George Harrison was a celebration of his life, music and philosophy, created to depict his life and journey from the material to the spiritual world. 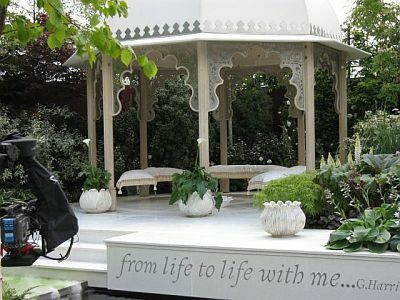 George and his wife Olivia loved going to the Chelsea Flower Show each year and they brought many ideas home. 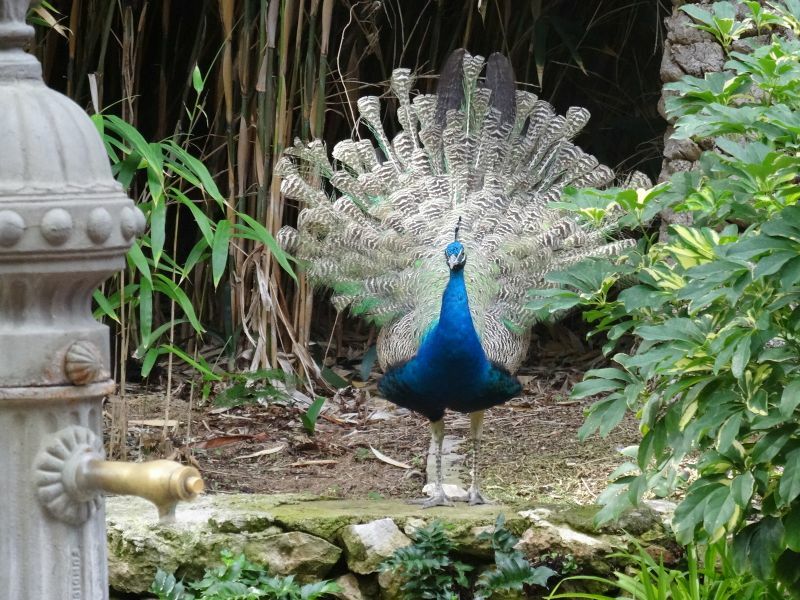 He was said to have viewed himself as a full-time gardener and part-time rock star. Yvonne spoke of ‘his incredible eye’ and considers that he could easily have been a garden designer himself. Clearly, this is what he was in his own garden of 60 acres, which had been neglected for many years when he bought the derelict property in 1980. It had originally belonged to an eccentric who had created areas of several different microclimates including rock gardens, caves, moss, water gardens and a lake. Yvonne talked of the privilege of creating gardens at Chelsea. Given the commission, she expressed how the ‘world was her oyster’, being able to choose her team, plants and materials with no problem. This was, she said, a dream job, whatever you can draw you can build. She is immensely proud of the results, and rightly so. To provide the context for her design, she started by giving insight into the background of George’s own garden at his home in Friar Park, Henley. She has been involved in designing and planning sections over the years and she retains her links there. This was fascinating and helped provide ideas for the design of the memorial garden. Friar Park remains a private garden; key plants and features chosen for Chelsea were those that were much loved there, such as maples, ferns, grasses, moss, Japanese anemones and other perennials. So to the design as seen in the photograph below. The model shows the idea of the ‘moving through the ages’ pathway. Divided into four areas representing different stages in George’s life: the Liverpool Garden representing his childhood, the Psychedelic 1960s Garden (the Beatle years), the Contemplative Garden (post-Beatle years) and the Afterlife Garden. The implementation of the building work started four to five weeks before the show week. All materials were chosen to be as eco-friendly as possible. For example, red bricks from Liverpool and a bicycle Olivia found that was identical to the one from a childhood photograph of George were used in the first section. The ages pathway was made in colours reflecting that stage of life. 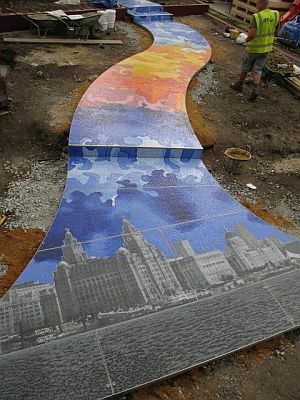 Brian Clarke, a glass artist, produced the amazing mosaic of Liverpool and the Liver Building for the childhood section. This was an impressive 1.2 metres wide. Yvonne chose to make a vegetable garden alongside this with plants such as peas, beans, parsley, cabbage and kale. George’s father was a keen vegetable grower and this was strongly reflected in his interest in gardening from an early age. Colour changes from blue to red, orange and yellow as the path moves into the Psychedelic garden. Then it changes from blueish into white. Planting alongside reflects these colour changes admirably. The Psychedelic Garden is jam-packed with hundreds of plants of vibrant colours. Yvonne had submitted a plant list with the design plan to provide the effect she wanted, but she explained that the planting list you start out with is not necessarily the one you end up with, as plant crops may fail or their names are changed etc. 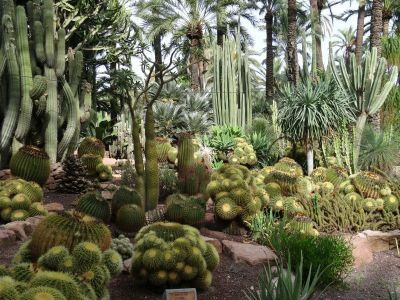 So it is really a sort of plants 'such as' list with a few definite ones which plant enthusiasts will be able to identify themselves. The whole Chelsea week is so rushed that there is not time to redo the list with the additions of plants you have managed to scavenge from local nurseries. Plants such as Acer palmatum "Atropurpureum" and Heuchera micrantha "Palace Purple" provide purple foliage, with Allium "Purple Sensation" and Lupinus "Masterpiece" for purple flowers. Examples of yellow and orange foliage were Heuchera "Caramel" and Ligustrum ovalifolium "Aureum", while for yellow and orange flowers Achillea "Moonshine", Hemerocallis lilioasphodelus and Forsythia "Lynwood Gold" were planned choices. Centranthus ruber, Lupinus "My Castle" and various roses were examples of red flowers. Blue and silver foliage examples were Achillea "Moonshine" and Santolina decumbens (syn. Santolina incana), while for flowers Ceanothus "Blue Mound", Delphinium "Bluebird" Lupinus "Gallery Blue", and Rheum and Hosta varieties. Pittosporum "Garnettii" and Miscanthus sinensis "Variegatus" provided variegated foliage. The post-Beatles garden was a contemplative garden. 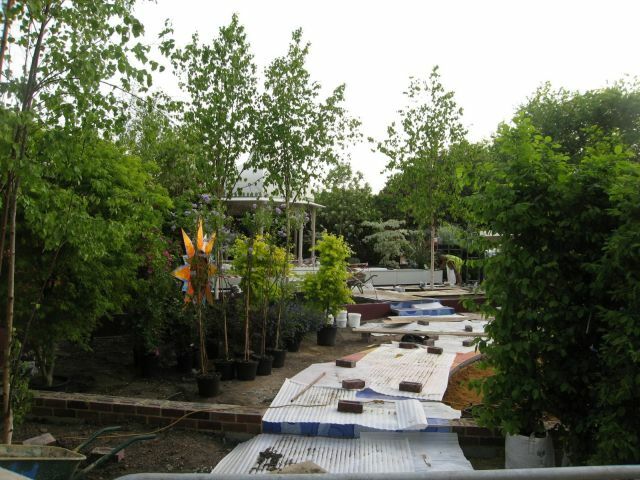 For this, Yvonne chose Betula utilis var. jacquemontii (Himalayan birch), having a more static, formal, upright habit than a silver birch with a denser crown, ideal for use as a specimen tree. Moss, a variety of ferns and wild grasses from Friar Park were also incorporated into the design. A water wall with a larger than life picture of George was featured at the end of this section. The Indian Temple was erected with beautiful artisan touches, it was intended to be ethereal. 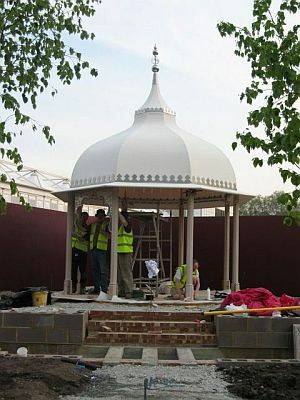 We were shown details of the tiny mosaic finish and lattice work inside the pavilion and the benches which were covered with beautifully made cushions. 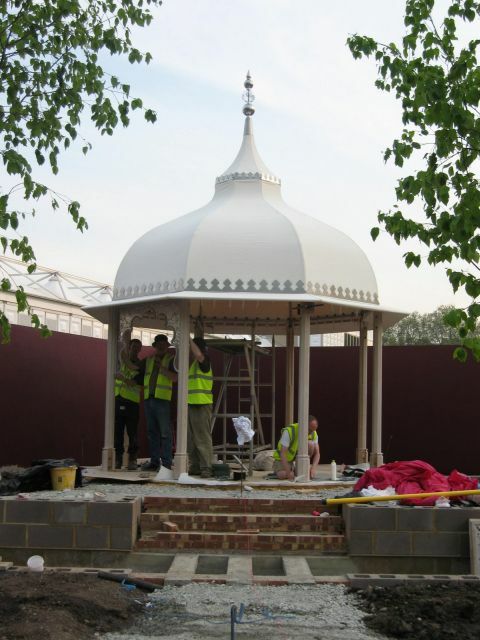 The base of the pavilion was inscribed: ‘Floating down the stream of time, of life to life ... with me’ (An extract from lyrics written by George). In the After Life garden, the planting was primarily white with choices such as white roses and lupins, Phlox paniculata, Cornus controversa "Variegata", Heucheravarieties and Hosta "Bressingham Blue. The result was exquisite. This was a fascinating presentation. All of us at the event were of an age when we knew of George Harrison but not necessarily the details of his life and values. Listening and seeing aspects of this that led to the design and making of ‘From Life to Life, a Garden for George,’ a memorial garden at the Chelsea Flower Show, was a privilege. Yvonne described her involvement in making this garden as an amazing experience; everyone wanted to be part of it and to give of their best. It seemed appropriate to learn that the pavilion went to Friar Park. We were delighted to welcome Yvonne Innes to Crete and thank her for an inspiring presentation and experience. She is a fellow MGS member, now living in the South of France. Our branch prides itself on welcoming members from elsewhere. A bring and share supper on Pam and Geoff’s delightful terrace completed the evening, thank you both. Also thank you to Pam for showing us around the garden. For older reports and articles please check out the archived (non-responsive) Crete Branch page. Valerie retired with her husband, Clive, to live full-time in Crete in 2005, having had a holiday home here since 2000. Their house is built on an exposed, windswept hillside with cold harsh winds in winter and severe, hot, desiccating ones in the heat of summer; this hillside was previously home only to goats. 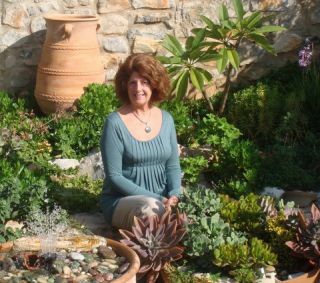 Gardening is Valerie’s passion and, with little previous experience of plants of the mediterranean, she is developing a garden which is in keeping with the landscape, which attempts to be waterwise and where new plants coexist with the original flora.Valerie has written about her garden for The Mediterranean Garden, No. 63.